Once upon a time, it was a range of tonal names that differentiated the GoPro HERO, including the Silver and White editions. And while many of these models are still viable choices, the latest version is only about the Black. It’s the big kahuna of the HERO line and it has been revamped so much that there’s only a need for a single model of this size. The most obvious difference with this model is its ready-to-go waterproof design, good for depths as low as 33 feet (10m), and face it, how many times do you need to go deeper? A lot, you say, then just use the optional Dive Housing; it’s good for close to 197 feet (60m). Besides the built-in water protection, the latest entry is pretty feature-packed. Not only does it capture 4K video that can make your audience feel like they’re in the middle of the action, but also it can capture it with one-button simplicity. Internal improvements help stabilize video in shaky situations, capture crystal-clear audio, and provide pro-quality photo capture. Combine that with voice control and GPS, the HERO5 Black packs a lot of punch in such a portable camera. 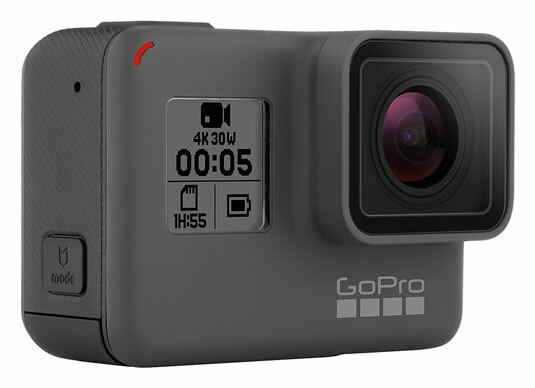 Photo courtesy of GoPro, Inc.
Touch screen display: There’s no more guessing at what you’re capturing or controlling the camera thanks to a built-in two-inch screen that allows you to view the scene, change settings, and edit footage. You can even upload footage to your GoPro Plus Cloud account, and access it on any device. Voice control: If you’re going to deal with those funny looks when seen talking to your GoPro, it’s nice for the camera to reciprocate. The voice command function will let you control the camera with hands, er, fingers-free operation. It understands 12 commands such as “GoPro start recording,” or “GoPro turn off.” As you can see by these examples, you must precede the action with GoPro, so the camera knows you’re talking to her. Stunning 4K recording: Capture 4K video at 30 fps as well as 2.7K at 60 fps for ultra high-resolution video. Impressive HD video: Record HD video at up to 1080p (progressive) up to120 fps for capturing maximum detail. The higher frame rate also provides the best quality applying slow motion in GoPro Studio. Improved audio capture: Thanks to the three-microphone system you can capture the clearest audio ever on a GoPro, both above and below the water. Internally, there’s advanced audio processing and improved wind-noise reduction. Auto Low Light: The camera adjusts exposure when light values change by changing frame rates to compensate when you move between dense shadow areas and bright spots. Better control over photos: Lots of reasons. First, there’s Protune for photos, which provides the same control over still photographs as you have for video. Like what? Changing the ISO setting, exposure compensation, white balance, color profile, and sharpness on still images and time-lapse sequences. You can shoot in RAW for increased flexibility in Photoshop, and the WDR modes capture maximum shadow and highlight detail. Built-in Wi-Fi and Bluetooth: Allows you to control the camera remotely through the Remo (waterproof voice-activated remote), smart remote and the GoPro App. It also enables auto upload to your optional GoPro Plus Cloud account.